Homemade Bloody Mary Mix with Fresh Seasonal Tomatoes - Spicy! Homemade Bloody Mary Mix with fresh seasonal tomatoes, smoked sea salt and spicy hot sauce. 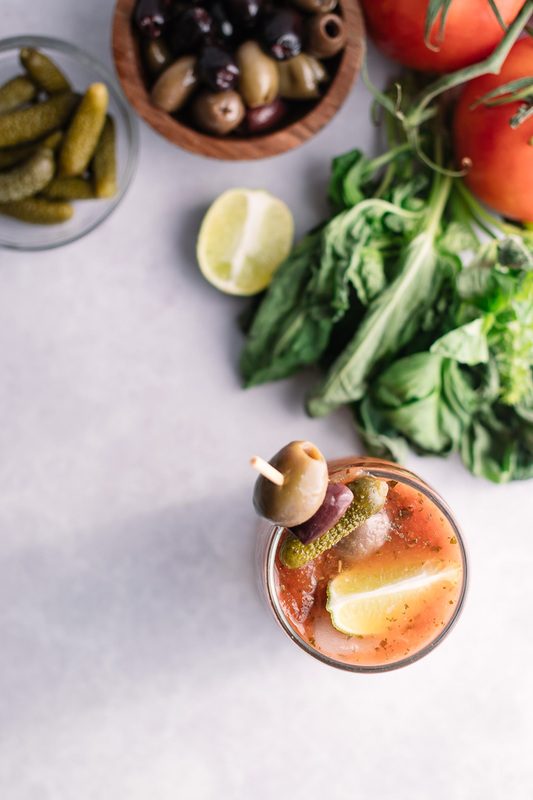 The perfect Bloody Mary for weekend brunch! To say I love a spicy Bloody Mary is an understatement. Blood Marys are one of my favorite “event” drinks, meaning a cocktail so good entire social events are planned around them. Most cocktails are those you could drink every day (though as a dietitian I do not condone daily cocktails, but you do you) but some are so good you need to save them for a special event. Margaritas, martinis, Bloody Marys…we plan entire events around these cocktails. Margarita nights, yes. Martini nights, definitely. Blood Mary brunch? Absolutely. Vodka tonic nights? Mmm, doesn’t have the same ring to it. 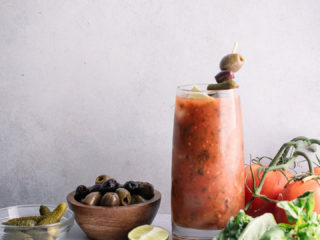 In my humble opinion, Bloody Marys should be spicy as hell and substitute as a “meal in a glass.” I want my Bloody Mary to be overflowing with olives, pickles, onions, celery and any other condiment you could stuff into the glass. I want my Bloody Mary to double as a small appetizer, because I’m usually only having one (at this point in my life) and I want to get the most bang for my buck. So now that it’s tomato season and we have tomatoes coming out of our ears, I needed to dream up a way to use the leftovers we had that didn’t involve tomato soup or caprese ciabatta. Enter the Homemade Bloody Mary Mix with Fresh Seasonal Tomatoes. Ditch the pre-made Bloody Mary mix for fresh seasonal tomatoes! Let’s just say it: there are some very bad Bloody Mary mixes on the market. I’ve had them, you’ve had them. Soupy and tomato juice-like, these terrible mixes make ordering a good Bloody Mary a gamble. So when I decided to craft my own mix, I turned to one of my favorite mixes: ZingZang. 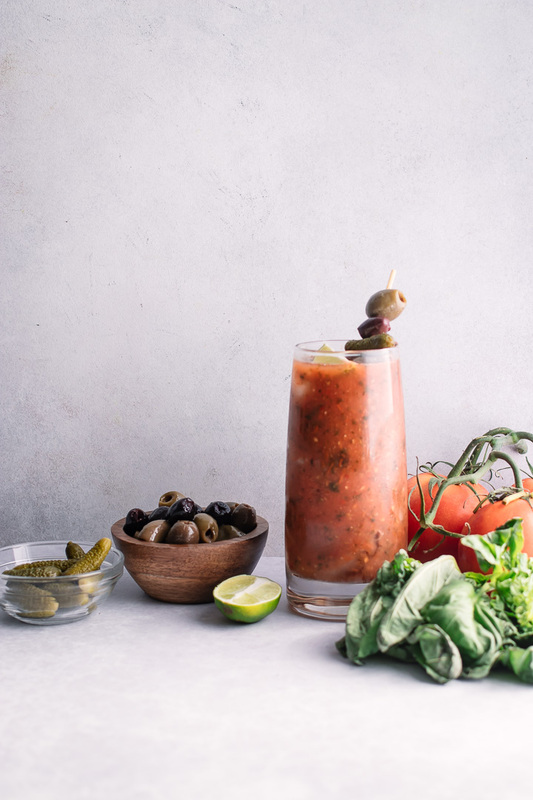 With a blend of smoke and spices, Zing Zang is an industry favorite for the perfect Bloody Mary and I set out to recreate its flavor with easy spices and herbs I already had at home. Nothing fancy, no fuss. Just a great cocktail mixer made from fresh, seasonal ingredients and a little love of some serious spice! First, you need fresh seasonal tomatoes. Any tomatoes will do, but I prefer a red beefsteak or heirloom because they are large and extra juicy. Romas are fine, but they tend to be firmer and the juices released by the large, soft tomatoes are perfect for making homemade bloody mary mix. Next, you’ll cut the tomatoes and add them to a soup pot. Then you’ll add your herbs and spices. I personally like fresh basil and oregano with a bit of red pepper flakes, smoked sea salt, and ground black pepper. I also add a small amount of Worcestershire and a bit of juice from a jar of pickles or capers, as well hot sauce such as Tabasco, but you can always add that later to taste. Next, you’ll heat the tomato, herbs, and spices on medium heat until the tomatoes soften and release their juices, about 15 minutes. Then you’ll blend the liquid with a traditional or immersion blender until smooth and let the mix cool before building your margarita. And that’s it! A super simple way to recreate the spicy goodness that is ZingZang. Bottom’s up! A soup pot or dutch oven: one of my most-used kitchen tools, a large soup pot or good quality dutch oven is essential for soup (and bloody mary) season. I hope you enjoy this super easy take on the classic Bloody Mary using fresh seasonal tomatoes! Let me know if you try it during your weekend brunch, I’d love to hear how it turns out. Craving more simple homemade cocktails? Check out our Spicy Ruby Red Grapefruit Margarita and Mango Berry Rosé Sangria recipes, both made with fresh seasonal superfoods. 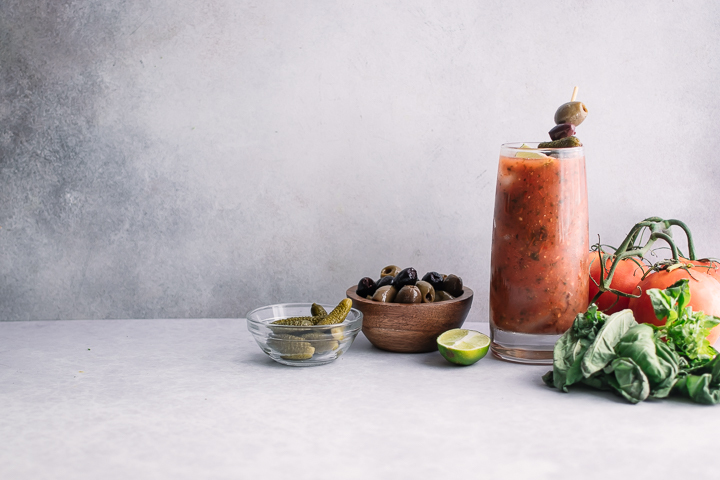 Did you make this Simple Homemade Bloody Mary Mix? Leave a comment below and rate the recipe to let us know how it turned out. 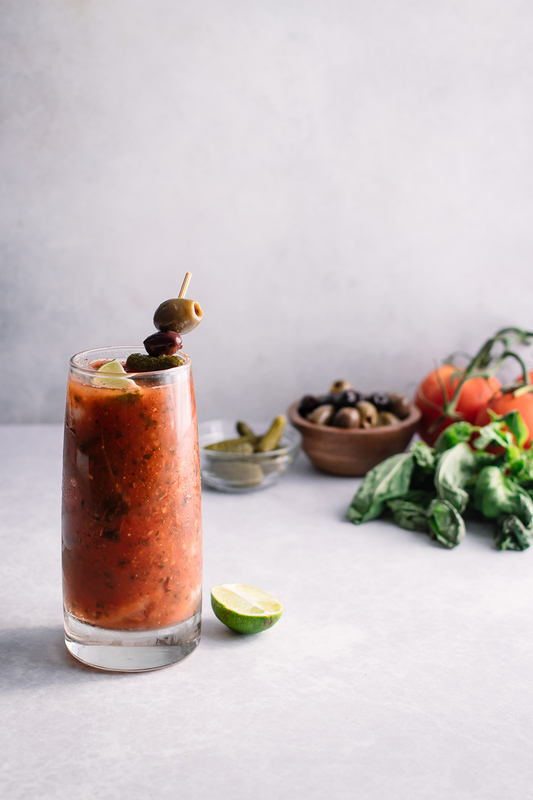 Save this bloody mary recipe for later by pinning to your favorite cocktail Pinterest board and make sure to tag me on Fork in the Road’s Instagram to show me your bloody mary creations! Condiments, as desired: olives, pickles, limes, celery, green onions, pearled onions, etc. 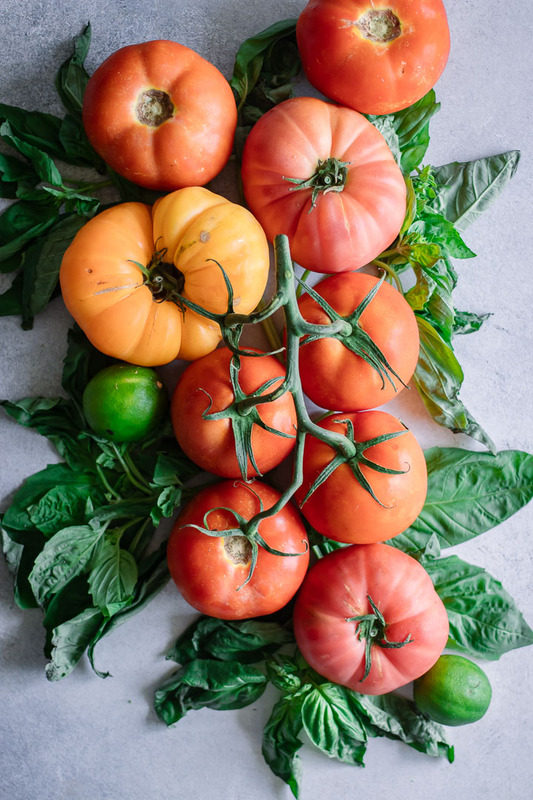 Cut tomatoes in large pieces and place in pot with basil, pickle or caper sauce, hot sauce, worcestershire, oregano, salt, and pepper in a soup pot. Bring to medium-low heat and simmer for 10-15 minutes, or until tomatoes cook down and become tender. When tomatoes take on a soupy texture, blend mixture with immersion blender in a food processor until smooth. Place in refrigerator until chilled before using. To make Bloody Mary: Combine vodka and Homemade Bloody Mary Mix in a glass with ice; stir to combine. Garnish with desired condiments and serve. Leftovers & Storage: Homemade Bloody Mary Mix will keep for about a week in the refrigerator. It will taste better after a day or two, so it’s an easy make-ahead mix! Nutrition: This cocktail mixer recipe is added sugar free and relatively low in sodium compared to premade mixers. Great! I’m happy you liked this bloody mary mix recipe, it’s one of my favorites. I hope you had it spicy! I hope you like it! Let me know how it turns out and if you add anything fun to your version. Bottoms up! I never thought to make my own bloody mary mix! I’m a big fan of zing zang so this looks like it will be right up my alley.